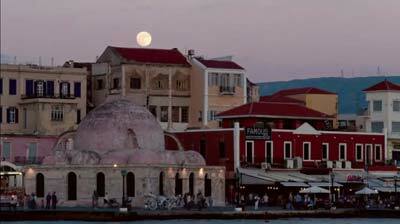 Many centuries ago, Heraklion was considered so important to its Venetian occupiers that they built a set of walls strong enough to withstand a siege that lasted a staggering 21 years and cost the lives of many, many fighters on both sides: Venetians and Cretans on one side, and Turks on the other. Heraklion walls are more than four and a half kilometers in length, and everywhere wide and strongly built in a triangular shape, it encompasses what we might call ‘Old Heraklion’ in a series of straight lines between its original seven ‘bastions’, or individual forts, and five gates, with the sea as its base. Important architectural monuments of the period that still survive today are the portals (gates) for the entrance to the city and the exit of the population to the countryside. The portal of the pier and the portal of the arsenals (none of them survives today) were built for the communication with the port. The portal of St. George for the communication with the eastern parts of the city,re-opened and offered to the circulation of the pedestrians, the portal of Jesus (known as New Gate) for the communication with the south parts, is situated in the south part of the fortified enclosure and the portal of Pantocratoras (today known as the Gate of Chania) for the communication with the western parts of the city. Apart from these there were others secondary ones of military or other character as is today the reconstructed one of Bhethleem. Lastly, the gate of Dermata, approximately in the middle of the homonymous gulf (today only its exit to the city has survived) was built for the communication with the sea at this area.